Students seem to have an extremely difficult time forming questions correctly. They forget the helping verbs! This chart is reinforcement and review of the helping verbs required for the proper formation of questions. The above downloadable handout is a great resource for elementary school students and students with special educational needs, learning difficulties, e.g. dyslexia at Beginner (pre-A1) and Elementary (A1) level. 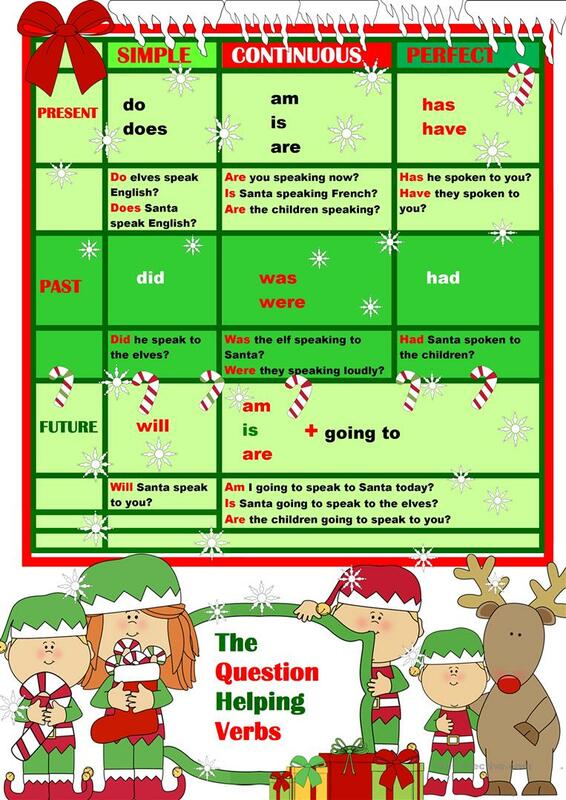 It is great for revising Future simple tense expressed with WILL, Past simple vs continuous tense, Present perfect continuous (progressive) tense, Present perfect tenses, Present simple tense and Questions (interrogative) in English, and was designed for working on your learners' Reading skills. It centers around the topic and words of Christmas. There is an answer key provided with the exercises.